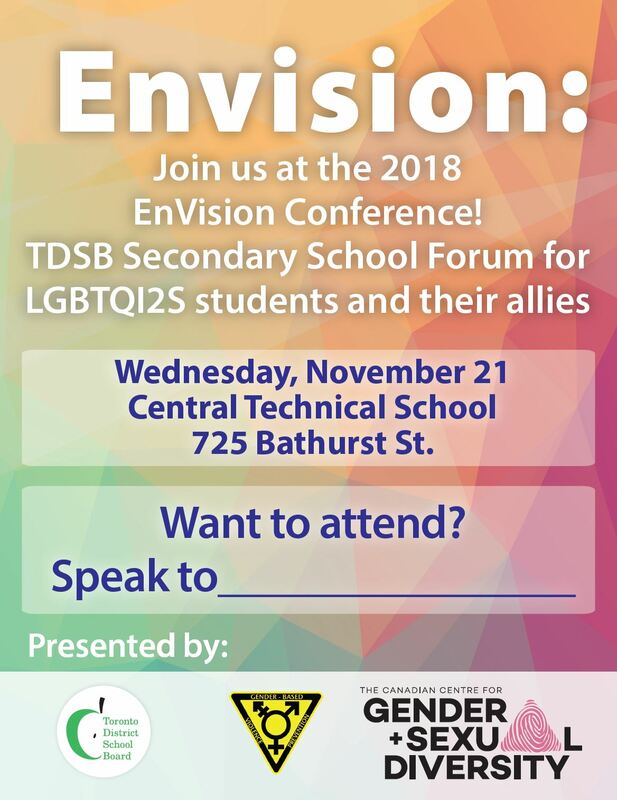 Join us at the 2018 EnVision Conference -- TDSB's conference for LGBTQ students and their allies! 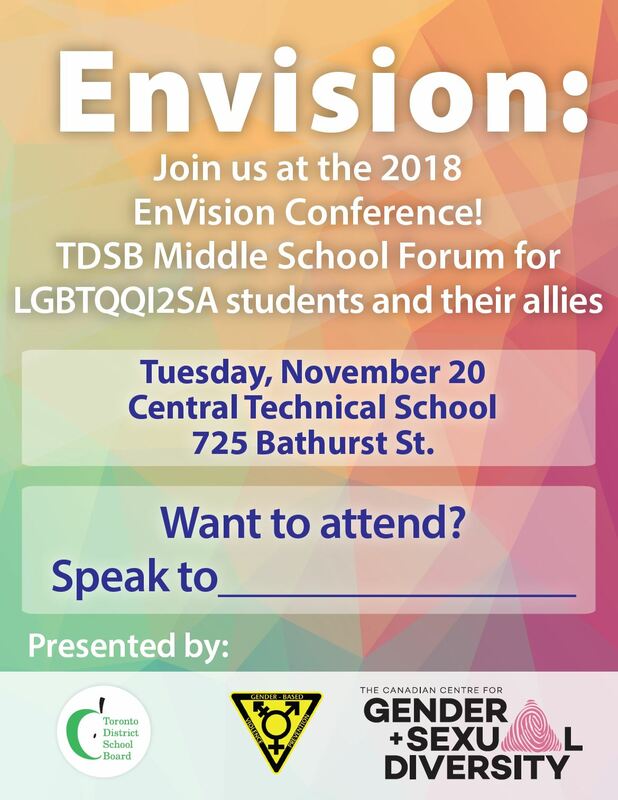 Created in partnership with The Canadian Centre for Gender and Sexual Diversity, Envision is specifically for TDSB students and created in consultation with our students. Students will have opportunities to engage with issues they are facing, find answers to questions they may have, and learn more about how to effectively do anti-homophobia and anti-transphobia work in our schools. Envision is free and includes snacks and a pizza lunch. Envision is most appropriate for students who are part of, or who want to start a gay straight-alliance, queer-straight alliance, gender justice group, equity club or a group of engaged students interested in social justice and healthy relationships. A special performance of "Ladies and Gentleman, Boys and Girls" with a talk back. Our MC is the unstoppable Ravyn Wngz - African, Bermudian, 2Spirit, Mohawk, Queer Transcendent Empowerment Movement Storyteller. Facilitated networking sessions for GSAs in the same part of the city. A community fair to connect students to resources across the city. Accessibility: Central Technical Institute is an older building, and the accessibility is not great, but there are doors on the east side with a ramp and no lip, an elevator between floors, and an accessible washroom. The access to the cafeteria is through the kitchen. Please let us know when you register if there are specific access needs that we can address for you. Does each person attending need to register? Yes. Each person must complete a registration form and select their own workshops. Some GSAs set aside time to do this as a group and others do this on their own time. Is teacher coverage provided? Staff coverage is provided by the school. Do we all need to go to the same workshop? No. Some middle schools have opted to have their whole GSA or student group travel together for the day. But each person has the choice of the workshop they want to attend. Check your GSA rep to see what your GSA is doing. What if my workshop is full? All content was created with student input and we hope that there will be a lot that interests you. We have made every effort to run each workshop twice. If it is full in one slot, we ask that you try to register for it in the next. If that it is also full, please select your next best choice. How many staff can attend? We are recommending one staff person per school group, so that we can accommodate as many schools as possible. If you need to send more staff to accommodate student access, that's fine. How many students can I bring? This conference is intended for questioning/queer/trans youth and their allies who are sincerely interested in attending and wanting to engage in the topics listed. All of your GSA students are welcome to register. If you have other students who are excited to attend, they may also register. However, this conference is not intended as a field trip for an entire class. Due to space limitations, each conference is capped at 600 - so please register early to avoid disappointment. Is lunch provided? Yes. There will be a pizza lunch with vegetarian, vegan, gluten-free and halal options. Please include any dietary restrictions on the accessibility question on your registration form. There will also be snacks throughout the day. Please bring a water bottle. In order to reduce waste, we are asking students and staff to bring a re-fillable water bottle. Do we really need to be there for 8 am? We expect up to 600 students and staff each morning. At registration, you will get your name-tag, program and schedule for the day (based on your selections) as well as a button with your pronouns. This may take a few minutes (or even longer) depending on the time you arrive and how many people are there. The earlier you arrive, the less time you'll have to wait. Feel free to enjoy our selection of snacks and juice as well as find your seats in the auditorium and socialize with friends or meet someone new. Our conference starts promptly at 9 and we have an exciting keynote you won't want to miss a minute of. Our students need TTC tickets to attend: This year we have secured funding for TTC tickets for students who are enrolled in schools that are ranked in the lowest 25% of the LOI. Email j.skelton@tdsb.on.ca for more details.